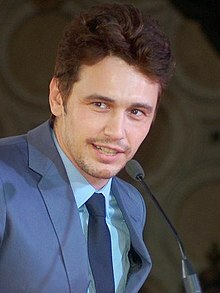 James Edward Franco (born 19 Apryle 1978) is an American actor, filmmakker an college instructor. For his role in 127 Hours (2010), he wis nominatit for an Academy Awaird for Best Actor. Franco is kent for his roles in live-action films sic as Sam Raimi's Spider-Man trilogy (2002–2007), Milk (2008), Pineapple Express (2008), Eat, Pray, Love (2010), Rise of the Planet of the Apes (2011), Spring Breakers (2012), Oz the Great and Powerful (2013), This Is the End (2013) an The Disaster Artist (2017), for that he wan a Gowden Globe Awaird for Best Actor. He is kent for his collaborations wi fellae actor Seth Rogen, haein appeared in aicht films an ane televeesion series wi him. Franco is an aw kent for his wark on televeesion; his first prominent actin role wis the chairacter Daniel Desario on the short-lived ensemble comedy-drama Freaks and Geeks (1999–2000), that developit a cult follaein. He an aw portrayed the teetle chairacter in the televeesion biografical film James Dean (2001), for that he wan a Gowden Globe Awaird. Franco haed a recurrin role on the saip opera General Hospital (2009–2012) an starned in the leemitit series 11.22.63 (2016). He an aw starns in the David Simon creautit HBO drama The Deuce (2017–present). Franco volunteers for the Art of Elysium chairity, an haes an aw tocht film classes at New York Varsity, the Varsity o Soothren Californie, UCLA, Studio 4, an Palo Alto High School. ↑ Kwok, Adrienne; Maese-Czeropski, Aidan (2015-09-07). "James Franco to teach film course in MAC". The Paly Voice. Retrieved 2015-09-29. ↑ Alter, Charlotte. "James Franco Just Announced His New Class in the Most James Franco Way Possible". TIME.com. Retrieved 2017-01-08. This page wis last eeditit on 19 Mey 2018, at 04:43.